Why are carrots good for you? Carrots are an incredibly popular vegetable, but why are carrots good for you? A range of amazing carrot nutrition facts including the number of calories in carrots. Is there a more radiant vegetable than the carrot? I don't think so. Not only is the carrot incredibly aesthetically pleasing with it's bright orange glow, but it also provides you with a wealth of nutritional benefits. Find out why carrots are good for you in this article, as I cover the nutrients that carrots are rich in, as well as the number of calories found in carrots. Perhaps the most iconic vegetable, with it's bright orange color and sweet crunchy taste, the carrot is a firm favorite of millions of people across the world. But why are carrots good for you? What is it about them that makes them so healthy? It is all very well being told that something is good for you, and that you should eat it, but what facts, figures and statistics stand behind this advice? If you have a little scratch at the surface of the notion that carrots are a very positive food to include in your eating habits, or the notion that any fruit or vegetable is for that matter, then you will learn all about the many vitamins and minerals that they contain an abundance of. In addition to these nutrients, you will also learn that they are mostly low in calories, cholesterol, and fat, things in foods that you should be trying to avoid high levels of. What more could you want from a food? Well nothing of course, which is why any dietician, doctor, nutritionist, of health professional will encourage you to load your diet with fruits and vegetables such as the carrot. First of all I am going to highlight various carrot nutrition facts for you, so that you can see for yourself what a powerhouse the carrot is when it comes to topping up your levels of certain nutrients. Below is a list of the nutrients found in a 3.5 oz serving of raw carrot. You can see the percentage of the total of each nutrient you should be getting each day, that this serving is able to provide. First of all we will look at the vitamins found in raw carrot. Now let's take a look at the minerals you will get from raw carrot. Additionally this serving of raw carrot offers 2.8 grams of dietary fiber, which equates to 11% of the total that your body needs in a day. It is clear from the statistics that I have shown above, that the carrot is a real powerhouse when it comes to providing you with vitamin A. It is also a very positive way to keep your levels of vitamins C and K in check, as well as your potassium levels. As for the rest of the nutrients that are shown, the carrot acts as a strong contributor to getting all that you need of them. There is no cholesterol in this serving of raw carrot, and only 0.2 grams of fat, of which none is saturated fat. Each of the above nutrients plays a specific role, or roles, in the maintenance of your body. They help basic bodily processes take place that you and I both probably take for granted. Anything from the generation of new cells, to sending nerve impulses around your body, regulating fluid levels and giving you energy, the things vitamins and minerals do for you are quite amazing. If you don't eat foods like the carrot then you are don't get enough of them, and this will have an adverse effect on your health. These carrot nutrition facts would vary slightly if you were to boil the carrot. A very interesting fact about carrots is that if you were to eat them with something that contains fact, so as part of a main meal with meat, or perhaps carrot sticks with some sort of dip, you are helping your body to absorb fat soluble carotenoids that the carrots contain. Something with a bit of fat in can give the carrots a bit of extra flavor too! So it's not all about cutting down your calories to a maximum, carrots can prove to be quite a treat too. Having highlighted the many nutritional plus points that a simple serving of raw carrot can provide you with, let's move onto something that everybody is concerned about when they are finding out about foods, calories. How many calories are there in a carrot? Well even for a vegetable I can tell you that there are an incredibly low number of calories in carrots. In the same size serving that we have mentioned above, 3.5 oz of raw carrot, there are just 41 calories, which is very low. This is another fantastic reason to include the carrot in your diet, as it is not going to harm your calorie in take at all. As you can see there are slightly less calories in boiled carrot when going by exact weight. It is also an interesting fact that by boiling carrots you are making the nutrients in them more likely to be absorbed by your body. Find out more about carrot calories here. I hope that I have been able to pinpoint several reasons here as to why carrots are a great food to include in your diet. Low in all things bad for you, and high in all things that are good for you, the carrot truly is a food that you should be eating with some regularity. If you don't believe the statistics on calories in a carrot and their nutritional benefits provided in the answer to the question 'why are carrots good for you? ', just ask Bugs Bunny, he swears by them! 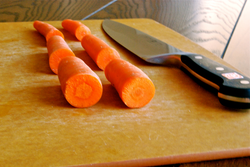 Yes, carrots are packed with vitamins and minerals :-) Thank you for your article! Interesting to see the mineral count, there's a good amount of potassium there. I suffer from high blood pressure and am always looking for foods high in potassium and low in sodium. Looks like I may have to increase the number of carrots I eat! I love raw carrots. I keep a container of carrots in water in my refrigerator at all times. I snack on them all day. Everytime I get one I also give my two dogs a carrot. They love them too. Carrots are also very good for your skin. Carrots are also very refreshing during the hot summer. Thanks for the article.